This is not the most peaceful and quiet of combinations, but the most grateful. Capricorns believe in self-discipline, they are able to act decisively and directly, do not lose a minute - in a word, it seems that they are capable of destroying the brightest qualities of Leo in the bud. He is playful, full of energy, he is eager to fight. But there is no need to imagine a clash of cheerfulness and envy. According to the views of Capricorn, hard work does not mean giving up gay games, but you can not do it alone, forgetting about the other. Everything has its time. Leo knows exactly how to achieve recognition. To conquer the world by storm, he can without the slightest loss. So he does, unduly dramatizing any event. You have already understood that between Capricorn and Leo there are easy misunderstandings, misunderstandings, and understatement - they require careful investigation, but if Leo is ready for this, Capricorn will have time to talk. As a child, Capricorn experienced many difficulties, manifesting himself. Often Capricorns have to quickly grow up and feel that they have never managed to truly be a child. So the appearance of a small Leo can hurt the most sensitive wound in the psyche of Capricorn, especially when the Leo child is eager to spend all his time in games. In essence, Leo offers Capricorn an opportunity to become a child again and try what he has previously missed. If Capricorn decides to remove the protective barriers, he can enter the world of childhood and recreate it for himself, and Leo will have a companion that can be drawn into games without caring about age. Serious mom-Capricorn is full of emotion: in her child there is so much optimism and faith in himself, he has such a vivid imagination! And a mother who does not have the habit of being in someone’s service is ready to treat the child as a prince, fulfilling all his whims, she is captivated by his charm, and from the first days of his birth. The more the Capricorn mom observes her child, the more difficult it will be for her to understand how he manages to overtake the others and acquire so many friends without making any special efforts. Capricorn woman always reminds her child that laziness hinders the work. But the Lion, it seems, achieves everything, even without a finger stirring. So for her, he is a mystery - this bright, sun-ridden child who, like a magnet, attracts people and successes. The Lion is always in the center of attention, but should he be condemned for this? This is his natural state, and if his mother upset him, it would have been bad for his pride. A mother should not show her ambition or be too rigid with this child. Of course, the consciousness that he is hoped for is only good for him, but if he is deprived of freedom of expression, he feels trapped. Such a child can act under the influence of the moment, following his enthusiasm, to study and discover the world in his own way, and he should be allowed to do so. Mother Capricorn will try to keep him from risky activities. She would like him to behave "like everyone else", instead of being so unusual. She is afraid that the Lion can be out of life if she does not follow the generally accepted rules. She does not understand that Leo will always be accepted in any society for his warmth, nobility and sense of humor. Persistent dad - Capricorn certainly a reasonable person. He wants to convey his very earthly ideas about life to children and is happy when he is listened to. But the Lion is not the child who needs directions. He listens to you, of course, but with an inner conviction that he knows everything himself. Indeed, he does everything in the best possible way, if he is given the opportunity to act in his own way. And although it may seem that Leo treats his father disrespectfully, ignoring his advice, he simply follows his own inner conviction, so that the Capricorn father should not take offense at him for it. Instead, it’s worth trying to pay tribute to this creative personality! If Leo is proud of himself, Capricorn is pleased that he is surrounded by expensive things that show everyone what he has achieved in life. The lion also loves luxury and beauty, and, like his father, pays attention to quality. And he appreciates the quality of not only things, but his own actions, and Papa-Capricorn can be proud of his child, who wants to be the first in school. The Father does not have any sense in pushing the Lion too much, forcing him to follow the path that his father chose for him. The lion is guided by his own motives, coming from within, and he is not one of those who can be forced to do what he does not want. It is better for Capricorn to play on the pride and dignity of his child: why let someone be better than yourself? As soon as Leo realizes this, he can no longer be stopped. 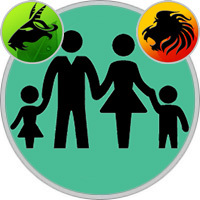 Capricorn should not be expected that his child will support all his traditional views or values. Leo - a small innovator, he is full of constructive ideas and would like to change everything for the better. Perhaps someday Leo will still come to what his father is saying, but for now let him be a bright, independent and therefore attractive person. You do not want him to feel like he was wearing a straitjacket? Capricorn is so lacking in sunlight, which is filled with the personality of Leo! Father, governed by cold Saturn, it is difficult to equal the warmth of his child, and yet his love for the little Leo should be more obvious. This child loves affection, because they convince him of their own worth and strengthen their self-confidence. If the little Leo is not properly treated, he can become rude, capricious - in a word, difficult. But the common sense of the father - Capricorn, of course, will tell how to avoid it.